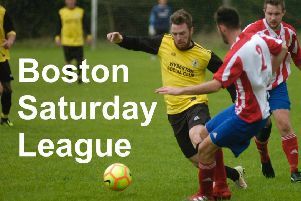 Shaun Boothby was the Boston Saturday League Premier Division’s top scorer, ending the season with 25 goals. The Coningsby player netted twice more than Wyberton Reserves’ Shane Brackenbury, who also added six to his tally in cup competitions, and Spilsby’s Liam Papworth, who scored four cup goals. The leading scorer across all four divisions was Andy Brown. The Boston Athletic forward scored 36 league goals and two cup goals for the Division Three team. Premier Division: Shaun Boothby (Coningsby) 25 league; Shane Brackenbury (Wyberton Reserves) 23 league + 6 cup; Liam Papworth (Spilsby Town) 23 league + 4 cup; Ian Jacquest (Pointon) 21 league + 2 cup; Nathan Rivett (Leverton) 20 league + 3 cup. Division One: Nathan Wright (Woodhall Spa Utd) 24 league (7 for Tetford); Mark Sharman (Old Doningtonians) 23 league + 10 cup; Victor Sibert (Friskney) 23 league + 6 cup; Curtis Yeatman (Railway Athletic) 23 league; Perrie Dale (Freiston) 22 league + 2 cup. Division Two: Dave Wilson (Holbeach Bank) 31 league + 3 cup; Mark Smith (Pointon Reserves) 22 league; Jack Cridland (Fishtoft Reserves) 19 league + 3 cup; Lee Waters (Sibsey) 19 league + 3 cup; Jack Hill (FC Wrangle) 17 league. Division Three: Andy Brown (Boston Athletic) 36 league + 2 cup; Bailey Noe (Boston Athletic) 26 league + 1 cup; Rafal Marczewski (Splading Harriers) 24 league + 1 cup; Oliver Gedney (Old Doningtonians Reserves) 19 league + 3 cup; Daniel Broughton (Northgate Olympic) 18 league.